I forgot to mention that lulu.com's introduced a new feature that allows creators to set discounts on a per-item basis. So naturally I've introduced a 10% discount off the price of the comic for this month only. Get 'em while they're hot! 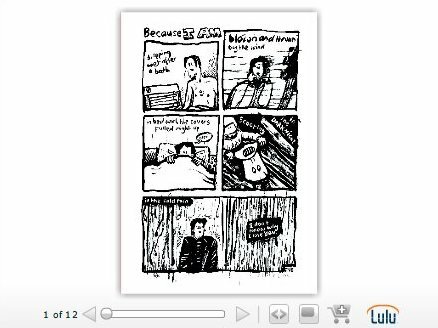 Delighted to hear from Carl at shelfabuse.com with a heads-up on my first review for Because I Am, alongside a couple of other small press/indie comics. And buy the book to your right or via his link on the site!